That's good and the remasters appear to be from the original master tapes and Queen II is remastered by Bob Ludwig. On the Steve Hoffman board (not a member, but I check it out) the overall general consensus on the remasters is a thumbs up too. I have the original CD pressings and some Queen LPs also. I might pick up the remasters too eventually, for the bonus tracks/B-Sides etc. Have you got Freddie's albums also?, I have Mr Bad Guy, Barcelona and the Freddie Mercury album (which is newer mixes/remixes of songs and a few tracks from the "Time" soundtrack). Also have Brian's "Back to the Light". I'd like to get the Freddie solo 10 CD/2DVD boxset but I think it's out of print now and pre-owned it's quite over priced. I've heard majority of it Youtube etc. in the past and there's some rarities on it like Freddie recording "I Can Hear Music" (which was a hit for the Beach Boys among others) under the name Larry Lurex. Amazon had it new for 250, but they had a a 3 disc version with most of the "new" stuff on the third disc. I bought Lacuna Coil - Delirium off Amazon. My first non-Weird All music purchase in probably over 10 years. OrangeRibbon wrote: Amazon had it new for 250, but they had a a 3 disc version with most of the "new" stuff on the third disc. Yea there's a 3 disc version too. The one I saw only has 7 songs on the third disc though. The Solo set is one I'm gonna keep my out for as it might randomly spring up somewhere pre owned for a good price. Roofus wrote: I bought Lacuna Coil - Delirium off Amazon. My first non-Weird All music purchase in probably over 10 years. How could hell be any worse. only 2 more albums and I'm done! For the first time since 2004 I've bought some physical music. And for the first time since the 90s it's on vinyl! Although I don't have a record player at the moment. I'm going to collect 80s singles with picture sleeves, mostly new wave and synthpop stuff although some rock and hip hop will be bought as well. Dr. Zoidberg wrote: For the first time since 2004 I've bought some physical music. And for the first time since the 90s it's on vinyl! Although I don't have a record player at the moment. I much prefer looking for vinyl then just looking on iTunes/Amazon etc. I think it's more fun too to actually search it out. Places like thrift stores, car boot/garage sales, charity shops etc sometimes have gems although the staff are often clued in so somethings are way over priced. I mostly collect most typee of music, but mainly soul, R&B, rock etc. I think one of the rarest i have is George Harrison All things must pass original pressing. There's a interesting doc I watched years ago about crate digging where Hip Hop producers search for records to sample. If I find it I'll add it. Only picture disc so far though is Elvis soundtrack one. There's some cool ones I'd like to collect though. I also have Moody Blue LP by Elvis still sealed and if it's a blue vinyl one its quite rare but unless I open it I don't know but I have it already as a normal vinyl. I think one of the oldest vinyl I have is Elvis golden records vol 2 from the early 60s. I also have a Elvis 78 too. I haven't looked around at pawn stores, charity shops etc. too much yet, just getting them from ebay for now. The prices are pretty good and the postage isn't bad as long as you order a few from the same person. Yea eBay is a great way to find vinyl too. If the charity shops etc are crate digger hotspots then you won't find anything too rare but it depends on what you're looking for. I found the Beatles red and blue greatest hits fairly cheap whilst if I bought them from collectors or online then they'd be a lot more. So I definitely recommend checking them out and local record stores if near by. Also theres quite a few docs about collecting vinyl, if you search for crate diggers fuse there's tons on there and it's usually producers, DJs, Egon who was at Stones Throw and Now Again. When they look thru J Dillas vinyl collection that's a very sad episode since he was a hugely talented producer who passed way too soon due to complications from Lupus. But in general they are very upbeat just thought I'd mention the Dilla one if you check it out. I got the Dilla tribute album a few years back where a portion of the proceeds goes to charity. I need to collect more Hip Hop vinyl but I've got most on CD but classics like by Run DMC, Ice Cube, NWA, Ice T, Public Enemy et AL ID like to get on vinyl. I think one of my rarest records is Mavis Staples Time Waits For No One on Paisley Park Records and it was one of the cheapest too. I have quite a lot of 45s too. Over here they mostly have crap like John Denver and Toto. I saw Thriller once. Charity shops aren't worth Trawling through 4 million CD's or records to find something that could even be remotely good.. I recently tried half an hour looking... for a John Lennon CD and Bad Religions worst album is not a good use of half an hour. I saw a signed copy of Thriller but it was most likely a fake one and someone copied the signature. Otherwise it would have been a awesome find. But the odds of finding a legitimate signed Thriller LP in a charity store are slim to none I think. Plus they'd have someone check it out online and put it in a Sotheby's auction or something. Also half the part of vinyl collecting I think is trawling thru tons of things. Sure it can be a waste of time but when you find something rare or what you are looking for it can be rewarding. Also you will see some way over priced records in record shops it's all really down to how you much you want to pay. In the Crate Diggers docs you have folks say they pay hundreds or a thousands on really obscure records just for a tractor drum track etc they can sample or use in their DJ set. Like with any form of collecting I think in some instances it can get too much especially when folks look for first pressings or really rare obscure music. For me I just get records I like or have heard about. I don't really go thru record collector and pin point the rare things and hunt for those. Because if you did it would be like finding a needle in a haystack. But it's fun to find LPs which you don't think you will like I found one by the group Honey Cone a while back who had a hit with Want Ads on Hot Wax/Invictus and it was something i didn't think was released here. But again its really were you search and you might find hundreds of classical/easy listening records to a ratio of one or two good records. Although and I'll go back to the documentaries you'll hear they spend hours upon hours searching thru crates of records. But it's all part of the fun that after searching thru everything you find what your looking for. But if it isn't too rare or hard to find you'll be able to find it relatively easy anyway. Yeah I remember seeing a DJ Shadow show on MTV 20 years ago where all he did was drive around California used vinyl stores. 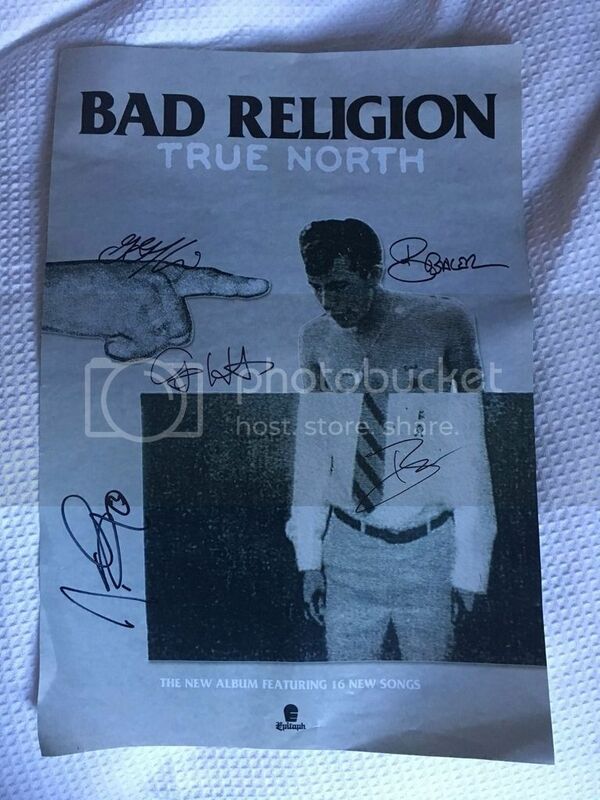 So I bought a bad religion true north poster for $25 including shipping. To me, it appears to be signed by Greg Graffin, Brian Baker, Greg Hetson, Jay Bentley and Brooks Wackerman. It all appears to be in ink, and not printed on to the poster. The return address on the tube is Warner Music Australia Pty Ltd. 36 Wellington St Collingwood. So I apparently bought A signed poster. I will get it framed even if the autographs are fake.. I must do some more investigating to see if they are real. But coming from Warner Music Australia, I'd say it'd be real. Looks real to me, if it was autopen/pre-printed autographs you'd notice because they do look fake. Seems like this is a signed promotional poster, which I'd guess they signed a few of for competition giveaways etc. Interesting it came from WB Australia but that confirms to me that it's legit. I doubt someone would fake Bad Religion's autographs. I'd only be suspicious of someone like The Beatles or Kurt Cobain or Led Zeppelin, etc.